T&S Window Screen Repair and Window Cleaning is Orange County's best value for mobile screen repair. Our family-owned and -operated, fully licensed business has been providing high-quality mobile screen services to Yorba Linda, Huntington Beach, Irvine, Fullerton and beyond at very affordable rates since 1990. 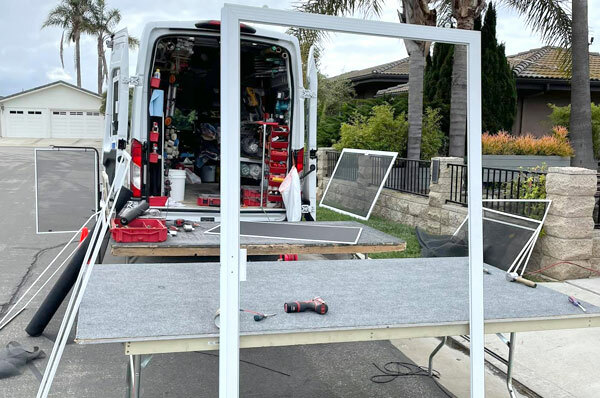 Our mobile screen service includes frame repairs, rescreening, and screen upgrades for windows, sliding screen doors, swinging screen doors, and retractable screen doors. We have thousands of satisfied residential and commercial customers, and receive the majority of our business through our returning customers and referrals. By calling T&S Window Screen Repair and Window Cleaning for all of your mobile screening needs, you can be confident that our professionals will more than meet your expectations. Before we begin any work, we will provide a free onsite consultation, in which we'll assess your screens, discuss your options, and provide an upfront estimate. If a door or window screen has been ripped, warped, or damaged, we simply replace the mesh screen with your choice of fabric. We offer long-lasting, high-quality mesh screen fabric, solar screens for UV control, and nylon screens for those with pets. Our screen mesh fabrics are available in either charcoal or gray. If you have a window screen or frame that is rusted or bent, you can give us a call for a fast and affordable fix. We specialize in window screen and frame replacement. All of our frames are custom sized to achieve a perfect fit and feature heavy-duty aluminum as well as all-aluminum corners for lasting durability. You can choose from white, bronze, almond, or anodized aluminum frames. Our window screens are priced similarly to those you'll find at your local big box store but are stronger, longer lasting, and professionally installed. 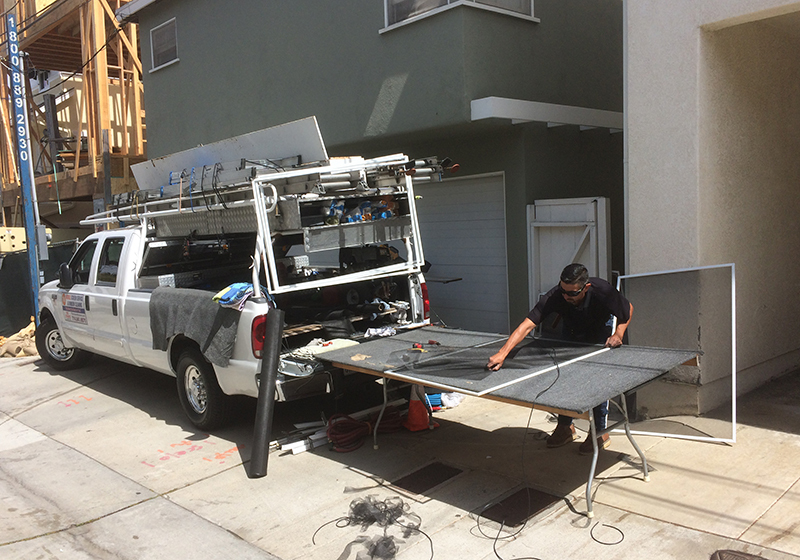 Call us today to schedule our mobile screen service in Yorba Linda, Huntington Beach. Anaheim, Anaheim Hills, Fullerton, Tustin, Irvine, or anywhere else in Orange County. Mobile screen replacement and repair can often be scheduled for same-day service and completed in just a few hours. We have the capacity to handle any number of screens, and have no minimum requirements. All of our mobile screening services are backed by a one-year warranty on workmanship. We completed this screen repair in Huntington Beach, CA for a satisfied residential client. For this job we repaired the damaged window frames, rescreened two large windows, and properly reinstalled both screens.